Suitable for all skin types, the Beauty Angel ELT equipment stimulates the skin to naturally build collagen and elastin for a significant reduction in the major signs of visible ageing. The new "0.3" w/m2 compliant sunbed at Lisa's gives customers a deeper, longer lasting tan that is safer and gentler on the skin. 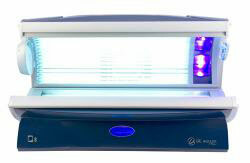 The output of this new generation in tanning lamps provides a higher UVA content than older equipment and allows for longer sessions and beautiful tans. Lisa's now offer Botox treatments by appointment only. Botox is the quickest and easiest way to remove unwanted lines and wrinkles. 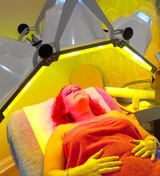 At Lisa's, our treatments are performed by Wendy Preston. Wendy is a qualified nurse of 32 years, 10 years experience in aesthetics, trained in Harley Street and an independent prescriber. Vibration plates have been causing a real stir in the fitness market for some time now. We always recommend a session on a Vibration plate after an i-Lipo treatment (This is complementary to all i-Lipo customers).